I’m an enormous horror film fan. I love mainstream horror, independent horror, ridiculous B-level horror, foreign horror, classic horror and all the various subgenres within the medium, especially the slashers and serial killers. With that said, 2013 has been awfully sparse on good horror films in theaters, at least. Obviously, October is when most of the fare will come out for the year, so maybe I’m being a bit premature, but even so, seven months into the year, I expect to have seen something worthwhile at the theater. 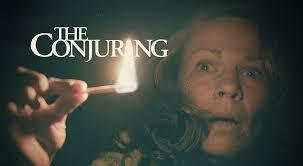 Fortunately, that seems likely to change with the July 19th release of The Conjuring. First and foremost, the trailer was damn creepy and atmospheric, which is a good sign. Secondly, there are a slew of good actors involved in this project. I, for one, have always been a fan of Vera Farmiga’s work and Patrick Wilson isn’t too shabby either. Moreover, reviews from aggregate Rottentomates are already coming in and they seem promising. Many critics seem to suggest that it’s “old-school horror.” I like the sound of that because old school horror is one of my favorite horror film types; the hallmark of which is the “slow burn.” That is, there isn’t a lot of jump at you gags or excessive gore or anything of that sort, but rather, a slow and steady sense of dread. Recently, the Paranormal Activity movies have done a marvelous job at honing in on the slow burn most effectively. Given all of this, I am stoked for the release of what I hope is the first really worthwhile horror film of 2013. I like to be scared. Bring it on, The Conjuring.